You know the drill – gardening consists of quite a few activities that have an optimal window for action. When timing is critical it can mean the difference between effective use of your resource or wasting money and time by treating incorrectly. When the grubs have gone deep in-ground to survive the winter. You want to make beneficial nematode applications while the grubs are within 3 to 6 inches of the top of the soil. Although Japanese beetle grubs spend up to 10 months underground there are two optimal times of the year to treat for the grub stage of this pest – the first is in spring and the second is from late summer to early autumn. When to apply depends upon your local temperatures, beginning in February and through April or early May the grub will be moving closer to the surface in preparation for emergence as an adult beetle. Once temperatures are consistently above 42° F it is time to apply the Heterorhabditis bacteriaphora (Hb) NemaSeek Beneficial Nematodes. 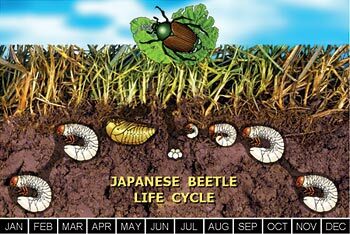 In the late summer and usually beginning in August the Japanese beetle will begin to go underground to lay eggs. This is an excellent time to apply NemaSeek nematodes (the Hb variety) as the eggs develop into larva – and are close to the surface of the soil. Again depending upon your local temperatures, you will want to apply the nematodes as early as late August and as late as November. Applying nematodes in the autumn will help reduce the number of grubs that nibble on your plant roots in early spring and it will reduce the number of adults that emerge and wreak havoc on your plants in the summer.